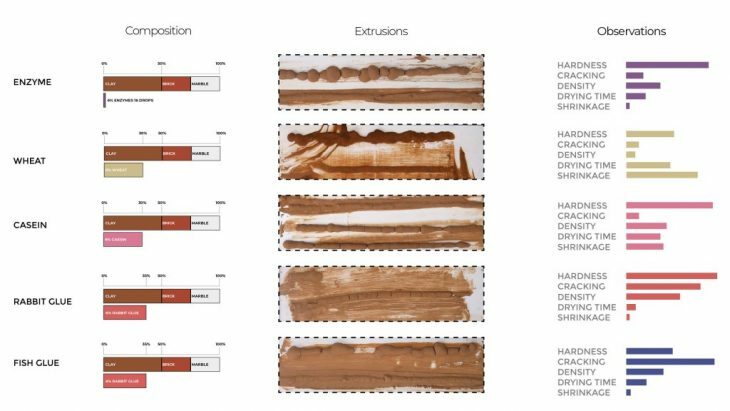 The research was conducted in order to define/understand the characteristics of the raw materials and additives in terms of extrudability of the pastes and 3d printability. For this reason the experiments were performed based on a trial and error method. The experimental study was conducted in two stages. 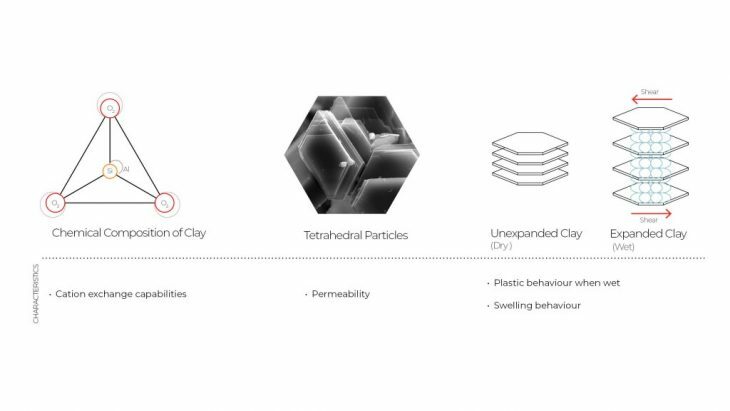 In the first stage, the experiments were conducted in order to define the characteristics of the raw materials (clay, brick dust and marble dust) and the additives (enzymes, collagens and starches) in terms of compatibility parameters (cracking and density) and drying process parameters (drying time and shrinkage) by making molding pastes and line extrusions. 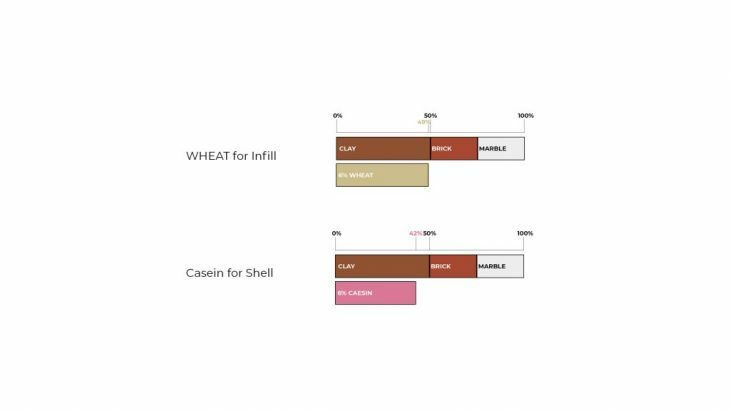 The successful mixtures/compositions with additives (casein, wheat and rice) were determined and the new mixtures/compositions incorporated with ash were studied in order to obtain cantilever structures by hand extrusion. In the second stage, multigradient 3D printing was studied, using robotic arms (robotic extrusion) in order to obtain textured and gradient structures. AIM : Study the properties of the additives with the base composition of the selected minerals. Properties under observation : Hardness, cracking, drying time, density and shrinkage. METHODOLOGY : Blocks of 75x105x10mm were cast and let dry in room temprature. All observations were documented after a 48h drying period. 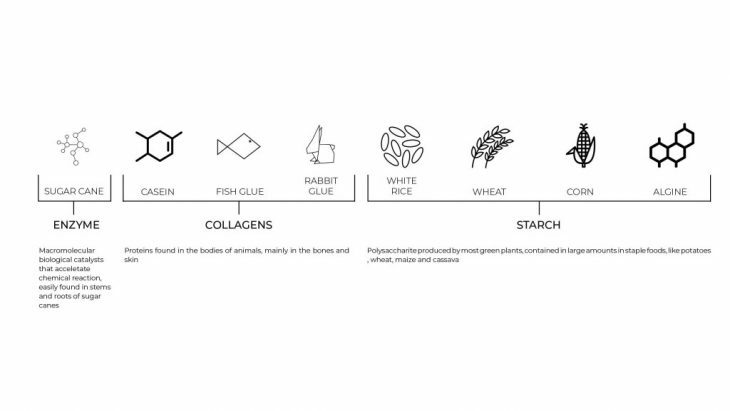 For the purposes of the experiments the percentage of each additive was tested in 3 variations of 2%, 4% and 6%. The results show that the quantity of 6% of additive provide with the best solution. 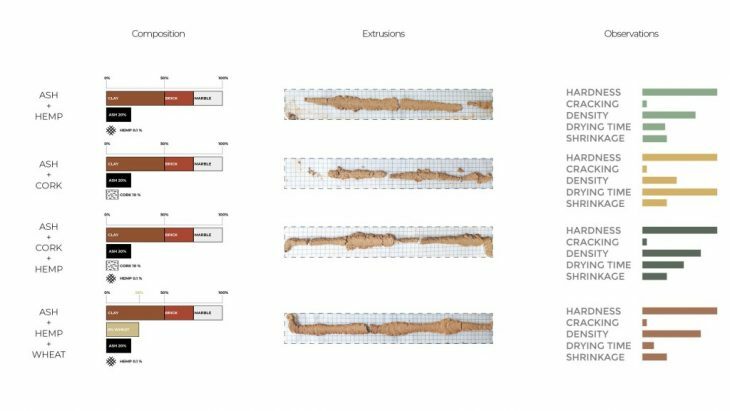 AIM : Study the properties of the successful additives from step 01 as lines created with the assistance of a hand extruder. Properties under observation : Hardness, cracking, drying time, density and shrinkage. METHODOLOGY : Lines of 10cm were extruded and let dry in room temprature. All observations were documented after a 48h drying period. Out of the line experiment, they were extracted the 2 most successful ones, which were the mixes with wheat and casein respectively. 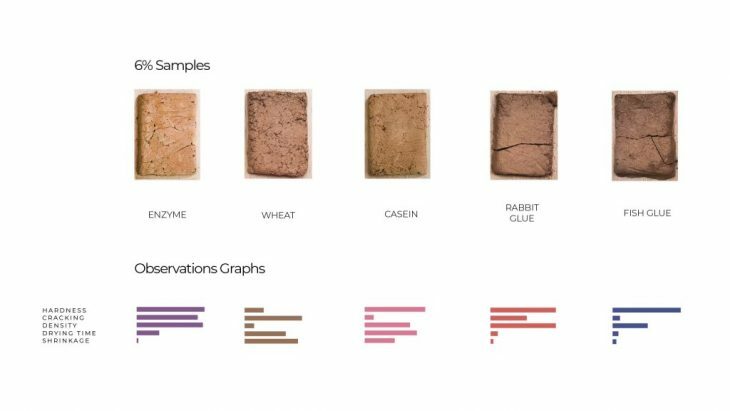 AIM : Study the capabilities of successful additives from step 02, when they are used to fabricate a cantilever structure. METHODOLOGY : A cantilever structure was designed with 3 parts : 1. Foundation, created using nails and wire and filled with caesin clay mix, 2. Shell, created using ceasin clay mix and a decreasing external layer width, 3. Infill, created using wheat clay mix. 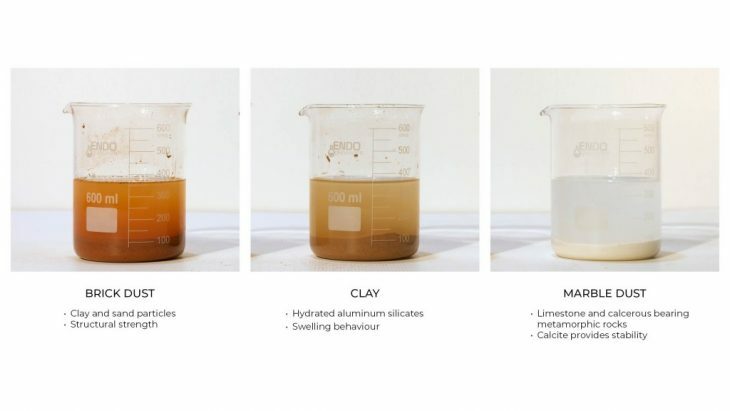 The clay-based bodies require some additives to achieve self-standing the structure. For this reason hemp was selected to give more strength to the body. 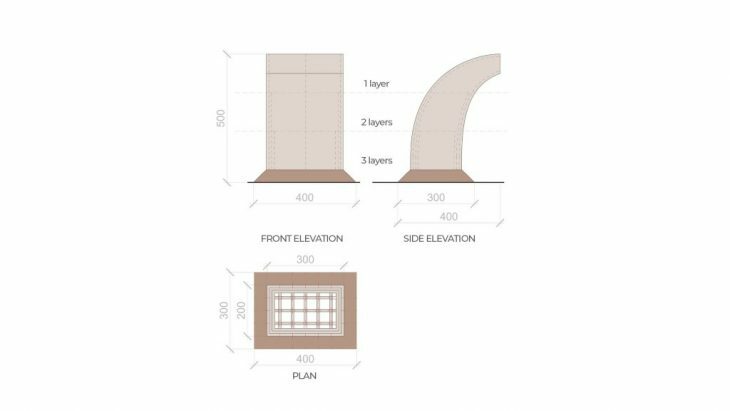 In the printing process, the drying period has to be controlled and stabilised in terms of shrinkage and cracking properties. In order to achieve this, ash was selected as an stabilising additive. 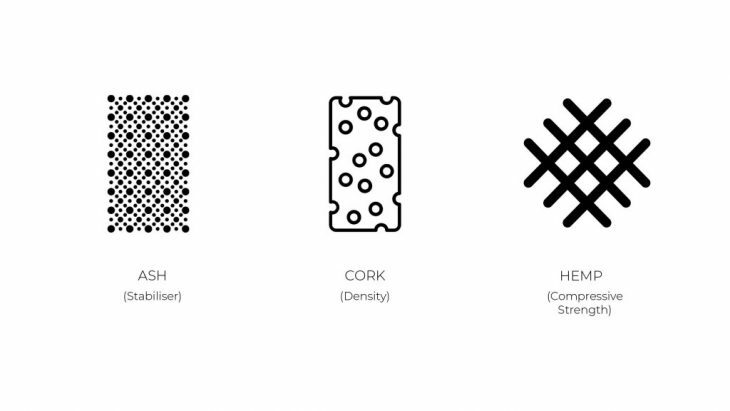 Cork is a highly porous material in its nature that enables the clay body (structure) with improved densities in terms of lightweight structures. 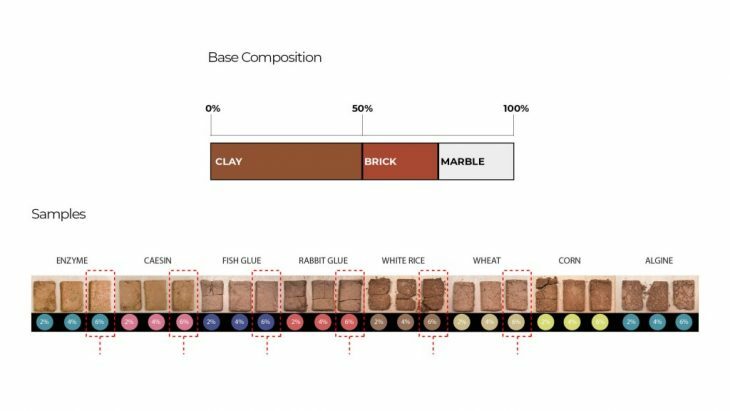 AIM : Study the properties of the additives’ combinations from phase 02, as lines created with the assistance of a hand extruder./ Properties under observation : Hardness, cracking, drying time, density and shrinkage. METHODOLOGY : Lines of 10cm were extruded and let dry in room temprature. All observations were documented after a 24h drying period. METHODOLOGY : Hand-mixed materials, fed into catridges and mounted on the robotic arm. 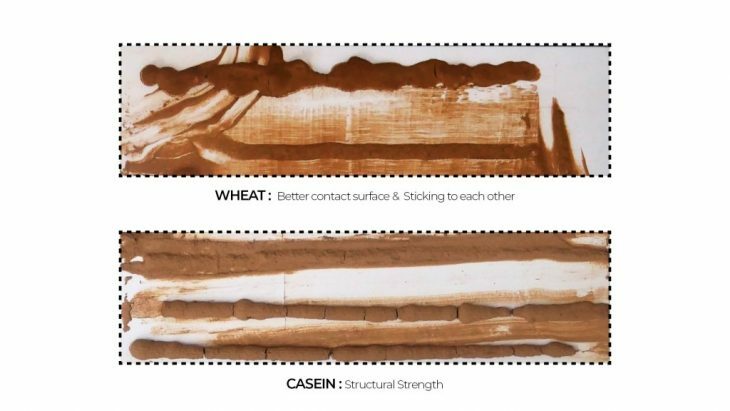 Wheat works as an adhesion factor. Hemp improves the tensile strength of the mix. 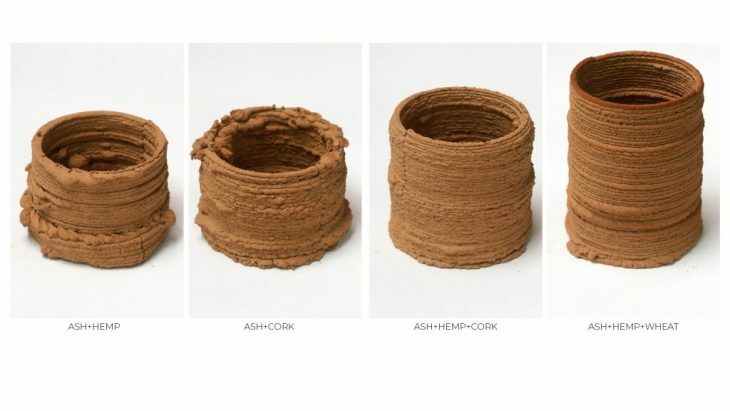 As a result of the studies, the compositions consist of clay, marble dust and brick dust incorporated with ash, wheat and hemp as additives were the successful clay pastes in terms of 3D clay printing.